Cypress (population 271) is located in far southern Illinois about 30 miles southeast of Carbondale. Another land mark includes the Ohio River which is a mere 10 miles south of Cypress. The main roadway to and from this southwestern Johnson County village is Illinois Route 37. The Missouri Pacific Railroad is currently the owner of the railroad line that passes through town. A branch of the Bear Creek flows by the northwest edge of town. The history of Cypress is a very long and extensive one. We are hopeful an area resident will provide us with some of the details of the town's early growth. The history of the educational opportunities in Cypress is also in need of research. It is probable that Cypress began a school system for its children in the mid 1800s. A high school was probably established in the late 1800s to early 1900s. We believe the high school of Cypress served the town proudly until the late 1940s. At some point the folks of Cypress agreed to send their children to nearby Vienna for their high school education. The spring of 1947 saw Cypress High School graduate its last class. It was in the fall of 1947 that Cypress High School kids began attending Vienna High School. George Mullinax, whose brother is pictured in the basketball photo below, was a freshmen at Cypress High that year, beginning his sophomore year in the fall of 1947 at Vienna HS. The original part of the Cypress High School building was built in 1917, an addition was completed in 1928, and the gym was added in 1945. The 30's team played elsewhere as there was no gym at Cypress during that time. "To train up the young to think and act in the spirit of friendliness and good will is universally recognized as an aim of education. Good will is a potent factor in the daily round of right living; it makes for harmony and peace within the nation and promotes friendship and justice throughout the world. The school can perform no greater service for humanity than to instill in the mind of the young this spirit of good will." "The former Cypress High School building was hit by a tornado on April 28, 2002. The damage was so extensive that the building was condemned. 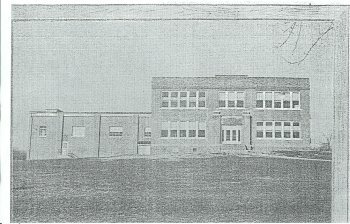 With the support of the FEMA, a new K-8 building was constructed just north of Cypress on Route 37. For more than two years, students attended school in downtown Cypress in portable classrooms." Cypress HS team nickname: the "Wildcats"
We know that Cypress high school competed in boys basketball (www.ihsa.org). We feel that track and baseball may have also been offered. Quick facts information such as team nickname, school colors and fight song, as well as conference affiliation are being sought at this time. 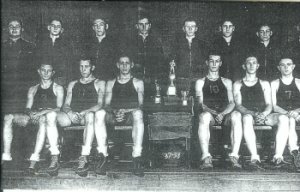 The Cypress High School basketball teams were king of the little schools in their area twice in the 1930s. Unfortunately coach's names and team records of these and other good Cypress squads are not available at this time. Scores involving Cypress High School in the IHSA State Tournament found on the website titled "Illinois High School Postseason Basketball Scores" are listed below. In the photo above to the right the following players have been identified. If you have the names of the others, please contact us via e-mail. Bottom Row: Oscar E. Mullinax, ----------, ---------, Maurice Richey, James Montgomery, Lowell Bost. **Final basketball game for Cypress High School, consolidated to Vienna High School in the summer of 1947.